We’ve upped our social game this academic year since an inspiring LACUNY talk in September 2013. On our library’s Facebook, Twitter, and Instagram, we follow a schedule of Mug Shot Mondays and Throwback Thursdays (#tbt), with other posts peppered in between. 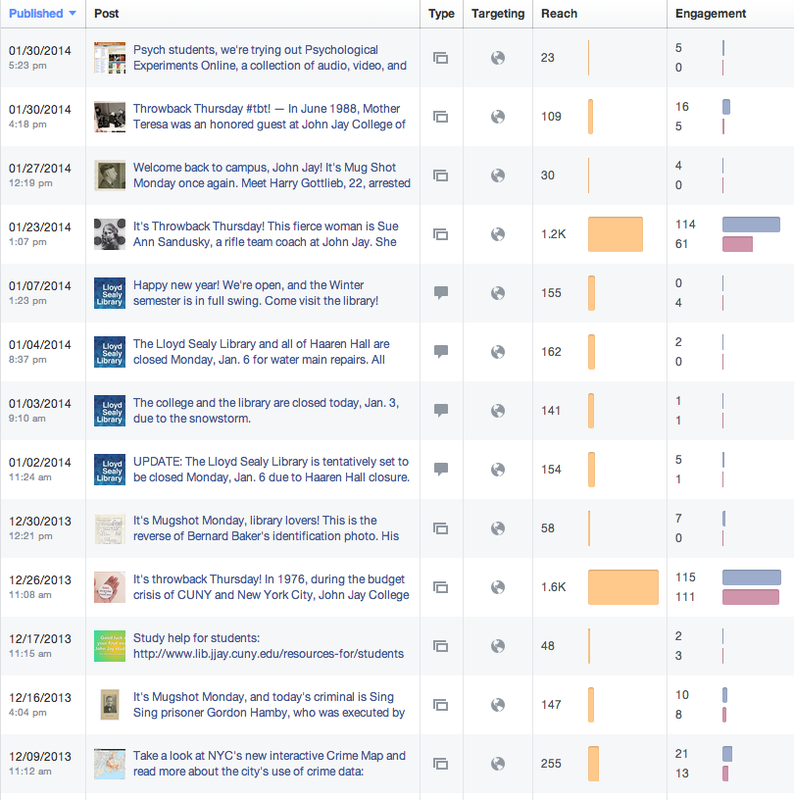 #tbt has been super successful on Facebook, in terms of views and clicks, especially since the main college account often re-shares our posts. Facebook insights December 2013 to January 2014 (I took a 3-week break, hence sporadic posts). Our posts have been genuine geek-outs (how cool are these old photos! ), but they’ve also been diagnostics and test runs. The students don’t know it yet, but we’ll be leveraging the popularity of our weekly posts to promote our upcoming Digital Collections site and next year’s 50th Anniversary Exhibit. What works? What doesn’t work? We’re realists — we know that our visual posts are probably one “oh, that’s cool” blip in our students’ Facebook feeds. But as optimists, we always include a relevant link (often in a subscription database) and a source link (to our Special Collections pages), with the hope that we’ll serendipitously inspire further research and interest in our unique materials. Facebook’s insights page can give us a pretty good idea of whether people are clicking through to the links we provide. If the link goes to a page on our servers, Google Analytics will also record that click-through. But there’s one more way that I like to track the effectiveness of our links. You can’t see it in the screenshot above, but Colonel Sandusky’s bio from the Facebook photo post got 5 clicks. 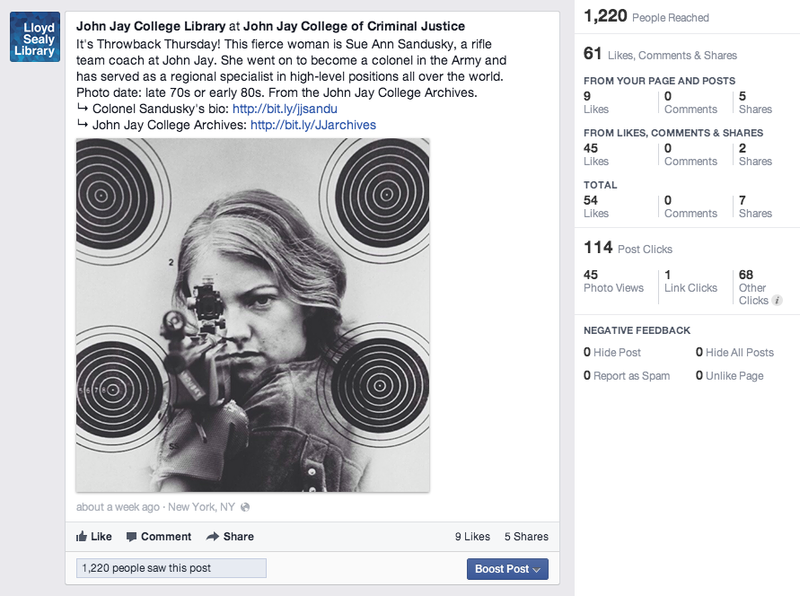 The shortlink to our Archives page has 42 clicks total, from all of our Archives-related Facebook posts. Drawing preliminary conclusions, even our most popular Facebook posts don’t bring in many click-throughs. A little disappointing, but that’s to be expected. People use Facebook when they want to be distracted and scroll quickly through brief diversions, not necessarily when they want to dive deeply into a topic. I’ll keep updating with other tales and tips for success in social media in our library. Other tips and examples are welcome! 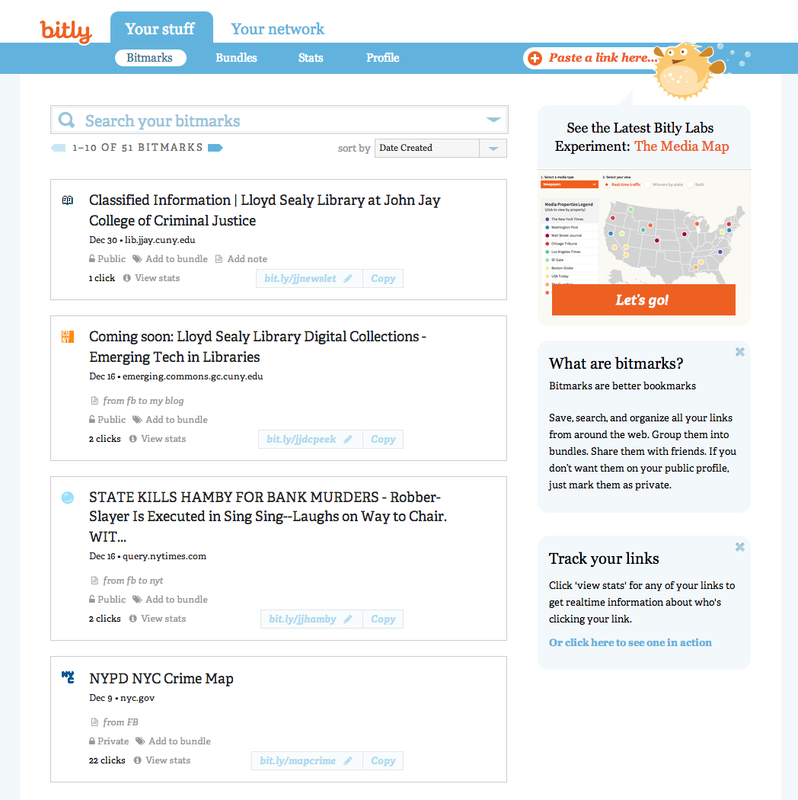 What are emerging tech librarians into this year?